Teleshia Parker is a licensed Cosmetologist and Customer Service Specialist. She graduated from Chic University of Cosmetology in 2006 and proceeded to KVCC to achieve her Associates degree in Business Marketing in 2010. She is currently a student at Western University working on her Bachelors in Textile and Apparel Product development and plans on graduating in the fall on 2016. Teleshia has volunteered with the Youth Basketball League program and worked with the youth of Kalamazoo Northside area for over 10 years. She is passionate about educating and encouraging women and young girls in the community about topics such as education, embracing natural beauty and inner strength, and become productive responsible ladies in the community. 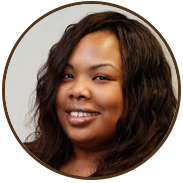 Teleshia hopes to see more young people in the community make their dreams a reality by achieving their goals, pursuing higher education, and eventually become successful professionals within their fields.